What does the Graduate! Network model look like in a community? The Graduate! Network has developed an approach to advising and supporting clients through college completion that addresses critical navigational, bureaucratic, social, motivational, and financial barriers, allowing colleges to focus on the academics with students who are now well-positioned to succeed. The Graduate! Network’s advising model is designed to engage Comebackers and meet them where they are at, academically, financially, geographically, and with regard for the complexity of their lives and responsibilities. Trained advisors guide Comebackers through the maze of options, helping to organize information, understand the complexities of returning to college, make the best choices, identify and solve problems. 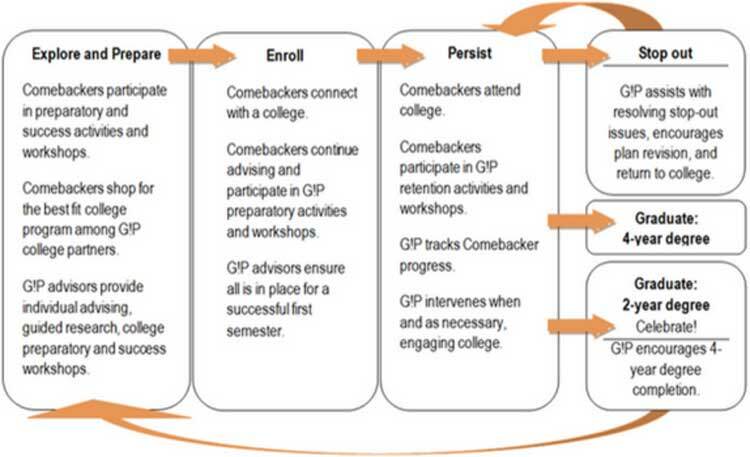 Participating colleges collaborate with Graduate! advisors to provide workshops and together with each Comebacker, to make a plan for college completion. Graduate! advisors stay connected to ensure Comebackers are supported through graduation. Program managers in each community track results via a customized data platform. How do we get communities up and running?